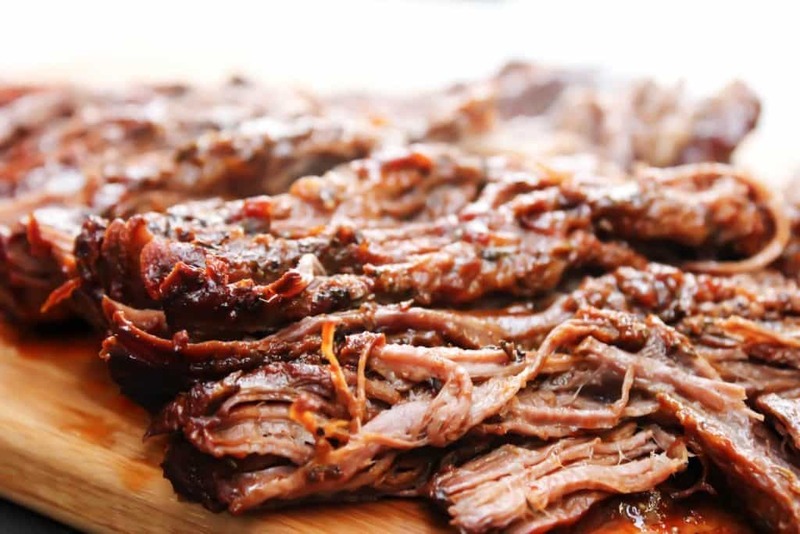 EASY BARBECUE BEEF BRISKET – a mouthwatering brisket rubbed with spices and liquid smoke. Cooked in a slow cooker until tender and juicy, then served and devoured. The smoky flavor of the beef cuts through the barbecue sauce making this the best brisket you will ever have. Did I mention how easy this is? Recently we made a trip to my husband’s hometown, Castle Rock, CO. He grew up there from mid-elementary school age until he moved for college. He loves his hometown. One of his fondest memories is the Star Lighting in downtown Castle Rock. There is a large star up on the “castle rock” that runs along a major highway, i-25 here in CO. They have a festival with booths, food, Santa, fireworks, ice-skating, Christmas carols and a whole lot of fun for everyone. What touches me the most this is one of the few towns that acknowledges Christmas vs the “holiday”. They pray, sing Christmas carols and then light the star. Every year they have a children submit essays on why the star lighting is important to them, my husband one year won and got to read it in front of the entire town. We now take our children there every year and watch the star lighting with my husband’s parents, brothers and their families. We love it. This year though we were running late due to Nutcracker rehearsal for Jojo, Jersey and my husband (I know he is the Rat King and a party dad!). We had to watch it on the side of the road, just barely pulling into the Castle Rock in time. While we were waiting to meet up with his family my husband bought some beef brisket. It was oh, so good. And that is what inspired me to find the best and easiest recipe. Sometimes more work DOES NOT mean better tasting. 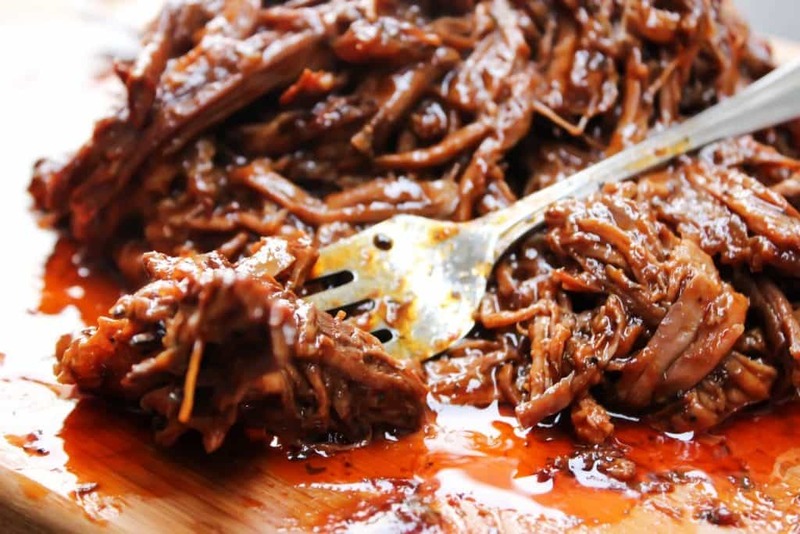 And this recipe for Easy Barbecue Beef Brisket won the hearts of all seven of us in our family and trust me that doesn’t happen often. How do you make brisket? Rub the liquid smoke all over the brisket, then using the rub that you just made rub that over the brisket as well, after you have rubbed it with the liquid smoke. 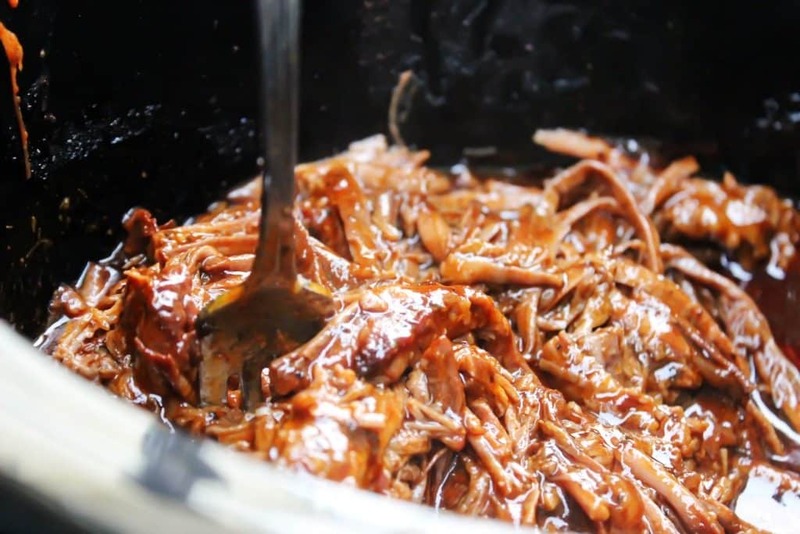 In the bottom of your slow cooker pour in Worcestershire and barbeque sauces; place beef brisket on top. Cover, and cook on LOW 8 to 10 hours or until fork tender. Dips, dinners, soups, even desserts! 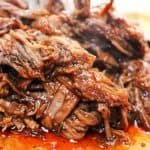 My favorite kitchen items I used to make this EASY BARBECUE BEEF BRISKET. Slow Cooker: I prefer one my slow cooker to have a timer. This is because I always some how forget about it. So having a timer and a lid that locks are two essential things for me when purchasing a slow cooker. Want to make this a complete meal? Try these sides and dessert to go along with it, oh and don’t forget some rolls. Homemade Hawaiian Sweet Rolls, Fudge Brownie No-Bake Cheesecake, Garlic Parmesan Green Beans, Best Mashed Potatoes Recipe and Quick & Easy Green Salad Recipe. To make things easier, put these sides in some beautiful side dish bowls. 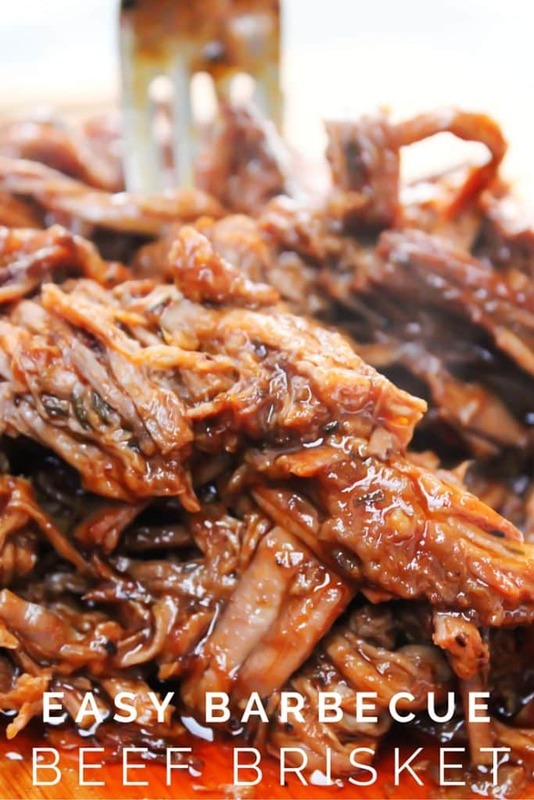 Don’t forget to pin these EASY BARBECUE BEEF BRISKET to your favorite Pinterest board for later! The layout of this post has been updated – some of the original images are. Originally posted in December of 2015. Love this recipe. Happy New Year! WOW! I am an American guy living in the countryside of Brasil and I had a hankering for a good brisket like my mom used to make. Found this recipe and made it this morning. WOW! I did not use the liquid smoke flavoring since I have no idea where to get that here or if they even have it here but this dish came out AMAZING!! So easy to make. The smell wafting through the house was a double bonus. Thanks so much!!! Cannot wait to make this again and pass this along to the world. I don’t have a lot of experience with liquid smoke. Would it be ok to prep this the night before or would sitting that long make the liquid smoke make the marinade too stong? about to make this, this Sunday. though i have many who are not barbecue freaks , I will be making them without the sauce. hmmmmm…. can’t wait. to try the recipe. Lila – how did this turn out? What kind of bbq sauce did u use for the bbq brisket? Can’t wait to try this. What do you serve on the side??? I made this yesterday with frozen brisket. Easy and awesome. Thank you! 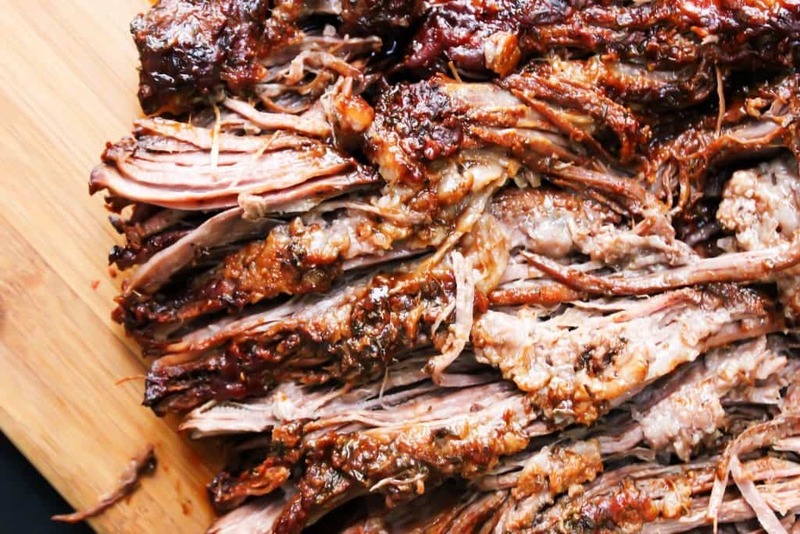 Goodness this brisket looks so tender, juicy and loaded with flavor! I could eat a big pile of this with just a fork 🙂 Thank you! Hey! This sounds super yummy! Have you ever tried to make it in advance? Does it reheat well? What if you don’t have a slow cooker? Does oven or sous vide works? I don’t have a slow cooker. Can you do this in the oven covered with aluminium foil? If so, how long will you cook this for and at what temperature? Yes you can easily do this. As far as the time you cook 40 minutes per pound, so that would make this recipe about 2 hours. And I would set the oven temperature to 300 degrees. Good luck and let me know how it turns out.